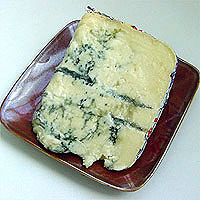 This is a semisoft cheese, mild and buttery, with an ivory-yellow color and blue-green marbling. This cheese is firmer, and more assertive in flavor and aroma. This variety is aged for 6 to 12 months; the longer aging produces an intense flavor, and a cheese with well-developed veins.